PayManager is a centralized web based portal used for processing the pay bills for the Employees of the Government of Rajasthan State, India . PayManager provides common integrated platform for preparing the government employee salaries in Rajasthan state. It is mainly used for data exchange with other important portals in Directorate of Accounts and Treasuries. It is very very important step for achieving paper less electronic payroll system like generating pay bill, electronic audit, electronic submission and processing of e-payslips for the employees. PayManager not only provides the pay bill preparation but also provides DA Arrears, Bonus, Arrears and Leave encashment Bills. 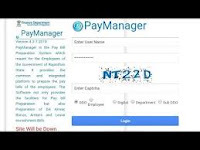 In PayManager portal we have DDO, Bank Login, Employee Login and Department Login. DDO is used for preparing Salary Bills, DA Arrears, Salary Arrears, Leave Encashment, Retirement Bills, FVC Bills and Surrender Bills. Bank Login used by treasury officers for e-payment files. Employee login is used for verifying the payslips and income tax statements. Department login used for third party for payment detail reports related to their employee details.